Two weeks ago, BartenderOne was asked to host one of the challenges in this years City Chase Toronto. City Chase is based on the Amazing Race concept, where teams of two, compete to complete 10 tasks (out of a list of 40) in the fastest time possible. The tasks are scattered all over Toronto, and contestants are given a clue sheet as to where the tasks may be located. Team are permitted to walk, run, or take public transit. Wheels such as bikes, or roller blades are not permitted, as well as any form of private transportation, such as cars, motorcycles, etc. The winners of this race will receive new Blackberry phones, and qualify for the National finals where they will have a chance to win a 2010 Mitsubishi Lancer! The BartenderOne challenge was simple. Make a Cosmopolitan with a little working flair. First, I instructed one of the team members how to make the cocktail, then I showed the other how to toss a rocks glass from their right hand to left behind the back, and finally how to pour a Cosmo into the glass…on their head! Some teams caught on quickly during the training, and had little trouble executing the moves. Other teams had great difficulty with this challenge, costing them valuable time in the race. A few contestants even poured the cocktail directly on their face, missing the glass entirely! However difficult it proved to be for some teams, we did not have any teams leave without completing the task. Whether they got it on the first or second try, or they spilled all over themselves, every contestant that stopped by appeared to really enjoy the challenge and that’s what it’s all about. The event was a great success, and I would definitely like to compete in the race next year. BartenderOne was happy to be a part of this event. To compete in upcoming City Chase events, click here to register. Check out the working flair bartending skills of Sam Kinred and the exhibition flair bartending confusion of Chris Cooper in this version of BartenderOne’s Move of the Month in High Definition. Dont forget to enter the Throwdown to go down to Vegas, to join the BartenderOne team in Las Vegas for the Legends of Bartending world championships. For more information, rules and regulations and to enter the competition click here. 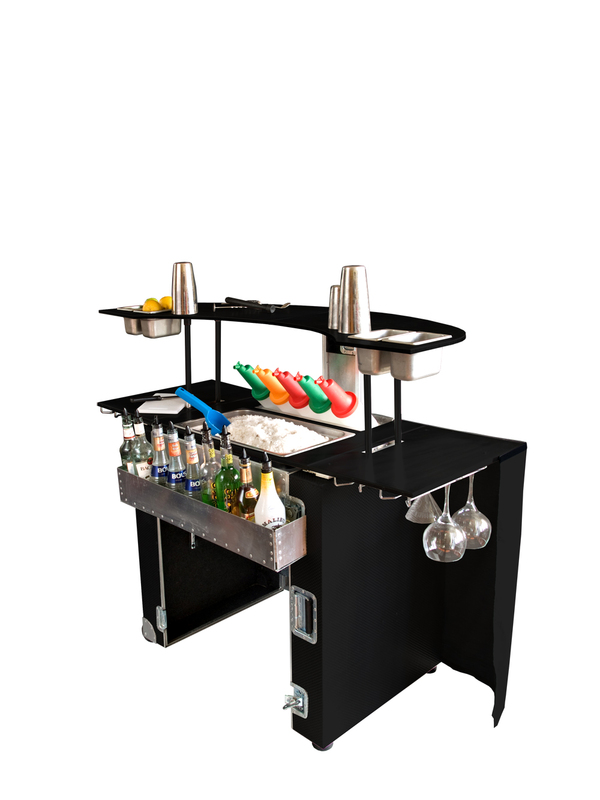 In an era when everything needs to be done yesterday, and cost saving is a real issue, this portable bar unit solves a lot of problems for a lot of people. When stored, it measures a tiny 7″x30″x24″, then in the blink of an eye, it assembles to a full size, fully functional bar station with ice well, speed rail, and garnish containers, with plenty of space left over for prep and glassware storage. For a restaurant that wants to increase their sales without investing tens of thousands in renovations for a dedicated outdoor bar, it’s an ingenious solution, that fits the budget, and conveniently packs away for the winter. For a golf course or banquet facility that wants to do a specialty cocktail station, it’s far more functional and pleasing on the eyes than serving on a banquet table with an ice bucket, and it’s portable both in storage mode and when fully assembled. 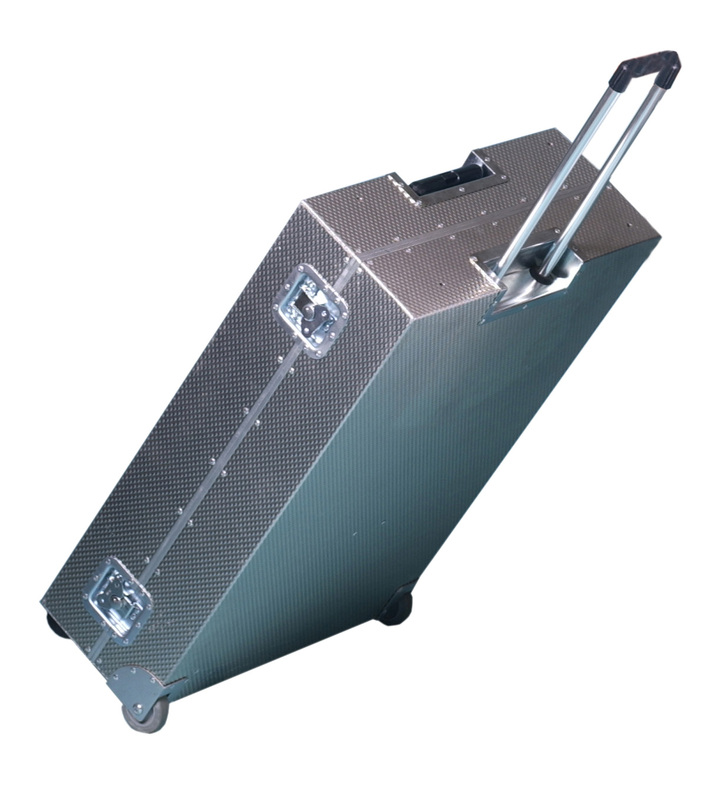 For caterers or the bartenders on the go, it weighs less than 60 lbs which means it flys on most commercial airlines, and means that your professionalism isnt compromised by lack of resources. When I got my first one, I was impressed with it’s sturdiness and versatility, and while I was concerned with it’s longevity (as with any portable system) the fact that it’s constructed out of steel, means that it stands the test of time. For more information on the Evolver Mobile Bar, you can check out www.evolverbar.com or simply click on any of the images above. To have a good look around it you can view a 360 degree rendering of the Evolver Bar by clicking here. 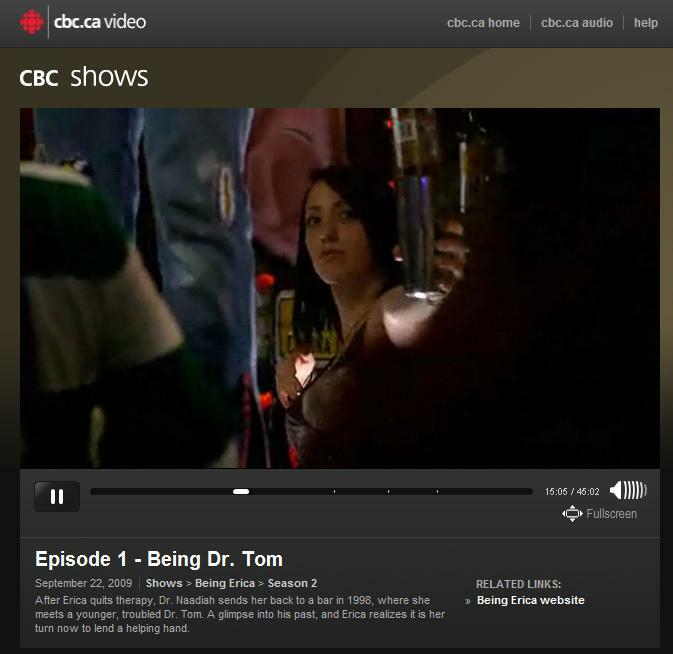 BartenderOne’s Edwina Neault was hired as a flair bartender to perform on CBC’s “Being Erica.” In the first episode of Season 2 – you can catch Eddie behind the bar mixing up some cocktails while “Erica” fumbles through a clumsy dance routine. On a recent trip to London, I was fortunate enough to meet with legendary mixologist Salvatore Calabrese at his bar “50.” Salvatore recently met with legendary race car driver Michael Schumacher to film this video… it’s a tongue and cheek look at why drinking and driving dont mix and is definitely worth a watch… It’s not what you’re expecting!